Math anxiety. I certainly have some degree of that , and so, apparently, do many children, meaning they worry about doing maths at school to the point where it causes negative emotional reactions, even becoming a fear. You don’t have to be lousy at maths to feel it, even the best math students can develop this fear. There is hope however, one might even call it a cure: Individual guidance can efficiently treat math anxiety in children and seemingly remove reactions in the brain’s fear center (amygdala). A very important factor would be for the teacher to understand better how the student thinks, and also to increase general awareness that there is such a thing as math anxiety. A study done by a team of researchers at Stanford University, California, USA, showed that with good invidivual guidance, students not only got better at solving math problems, the guidance also reduced their anxiety level. Can you imagine what it cost me to find this illustration?? 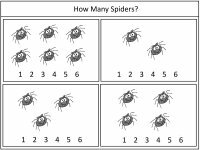 The researchers tested two groups of grade 3 children; one with a high level of math anxiety, the other with little or none. They were asked to solve simple math problems, individually and in a positive and encouraging environment, while their brains were scanned in an fMRI (Functional Magnetic Resonance Imaging) scanner. In the children with a high level of math anxiety, the brain’s fear center was visibly activated. The children then took part in an intensive individual guidance program, and when they were again asked to solve math problems while being scanned, the children with a high level of math anxiety both solved the problems in a better way and showed less fear. There were no changes in the children with little or no math anxiety. Other research on math anxiety has also focused on having good conversations about maths and creating a safe and tolerant environment where the student doesn’t feel exposed or ridiculed for not giving the right answer, rather feeling support and encouragement. Again, individual guidance shows results, getting help in a positive way when stuck, without the peer pressure. The aim is to follow up these studies to see if the anxiety level changes or remains reduced as the children grow older and start solving more complex math problems. I’m actually good enough at maths to put two and two together and see that it might still be too late for me, but that’s no big loss. To some children it could be though, both in terms of feeling well behind the classroom door and keeping as many doors as possible open for later. It seems individual guidance might open some doors. Read more about the research in the Journal of Neuroscience.